Freedom Patio Panel Pet Doors allow your pet to come and go as he pleases through your sliding glass or screen door. 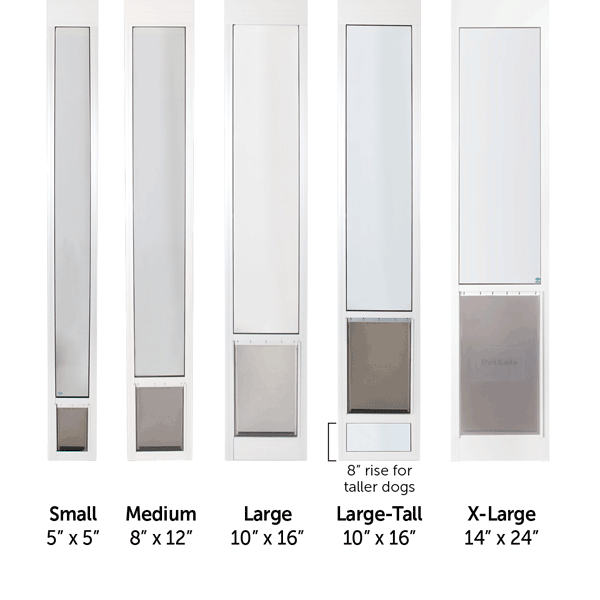 These panels feature a heavy-duty aluminum construction and shatter-resistant, tempered safety glass. They’re also equipped with the energy-conserving UltraSeal flexible flap system designed to keep the heat and cold outdoors. Installation is easy, with no cutting required. You'll slide the panel into one end of your sliding door track, secure it to the frame, and add weather stripping. Open and close the other side of your door easily. If you ever need to move, you can easily remove the panel from the frame and take it with you. Medium Up to 40 lbs. 8 1/4” x 12 3/16” 1 3/4"
Large Up to 100 lbs. 10 1/4” x 16 3/8” 4 1/4"
Large Tall Up to 100 lbs. 10 1/4” x 16 3/8” 8 1/4"
Extra Large Up to 220 lbs. 13 11/16” x 23 3/4” 4 1/4"
Caution: Small children can pass through door. This product can expose you to chemicals, including carbon black, VCM, Ethyl Benzene, Methyl Alcohol, and/or Toluene, which are known to the State of California to cause cancer and birth defects or other reproductive harm. For more information go to www.p65warnings.ca.gov.